I am reviewing the Brother HL-L3230CDW which is their latest iteration of a colour LED-based xerographic printer. These xerographic printers works in a similar manner to a laser printer but uses a row of LEDs rather than a laser steered by moving mirrors to light the imaging drum with what you are printing as part of the printing process. Brother is positioning the HL-L3230CDW as a follow-on model to their HL-3170CDW colour LED printer and its stablemates. But they are also running this model as a baseline printer for their new colour LED xerographic printing engine. The higher-priced pureplay stablemates based on the new engine also have a colour LCD touchscreen and offer more in the way of walk-up printing options such as working with Brother’s Web Connect online printing subsystem. 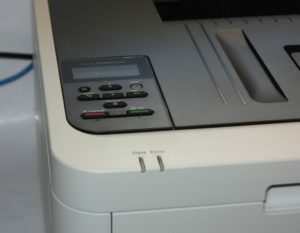 There are also some colour LED multifunction printers with the fax-equipped models supporting this same Web Connect as well. The Brother HL-L3230CDW is able to connect to your computer directly via USB or via your home network using Wi-Fi 4 (802.11g/n) or Ethernet. This review will be the first product review on HomeNetworking01.info to implement the new Wi-Fi Alliance “generation mumbering” scheme that has just been set in stone when it comes to what kind of connectivity to expect from a Wi-Fi wireless-network device. There is a small LCD display as well as a D-pad for basic machine setup functionality so you are not expecting much from this printer beyond a baseline print device. You have to open a lid to gain access to the toner cartridges. drum units and belt unit. Here, each colour toner cartridge is installed in its drum unit but you separately replace the toner cartridge and the drum unit unlike what happens with HP LaserJet printers. 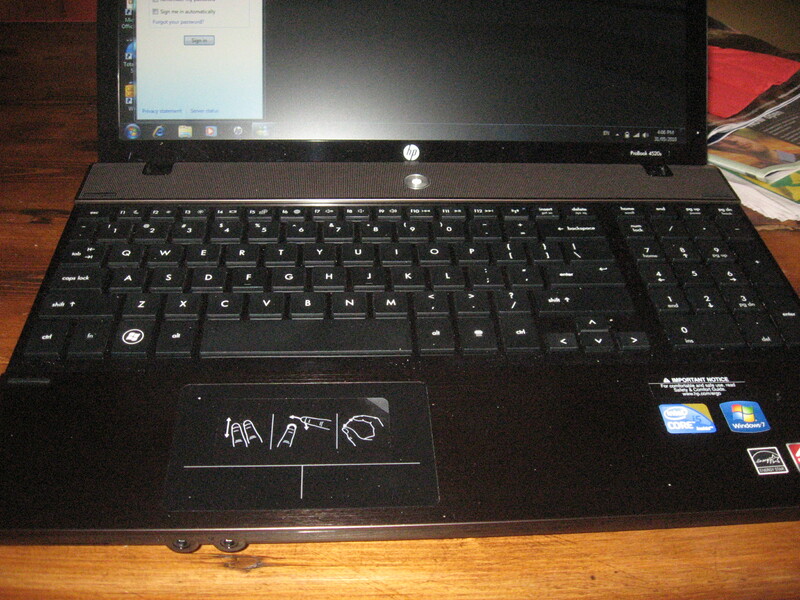 Here, each of the parts are easy to remove and reinstall which can be of benefit when dealing with paper jams. 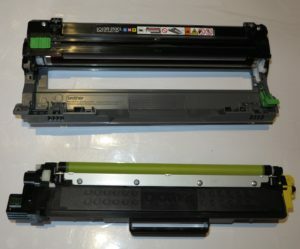 If you are dealing with a paper jam that occurred around the back of the printer, the fuser rollers are exposed when you open the back panel and release another black plastic panel to rectify the paper jam. This is a risky situation due to these rollers being hot after a print job. A security issue that will always come up regarding dedicated-function devices that connect to your network and the Internet is making sure these devices are kept up-to-date with the latest firmware. This is something I will be paying attention to regarding these devices and writing up about in these product reviews. Brother integrates in to their print monitor software installed on your computer a software-update monitoring function. If there are new versions of the driver or printer firmware, this program will let you know so you can update this software, whereupon you can update this software. It will lead to the installation of a printer-firmware update tool to install newer firmware. The Brother HL-L3230CDW has a standard paper tray for ordinary document paper. But like most of the popularly-priced Brother printers. it has a single-sheet multipurpose feed slot which can be annoying if you are doing things like run a batch of labels or print on special media. Due to its position in the market for its product type as an economy “bare-bones” printer, this printer doesn’t offer walk-up printing from USB, network or online resources. I have installed the driver software on to my Windows 10 computer from Brother’s official support Website and this installation went according to plan. 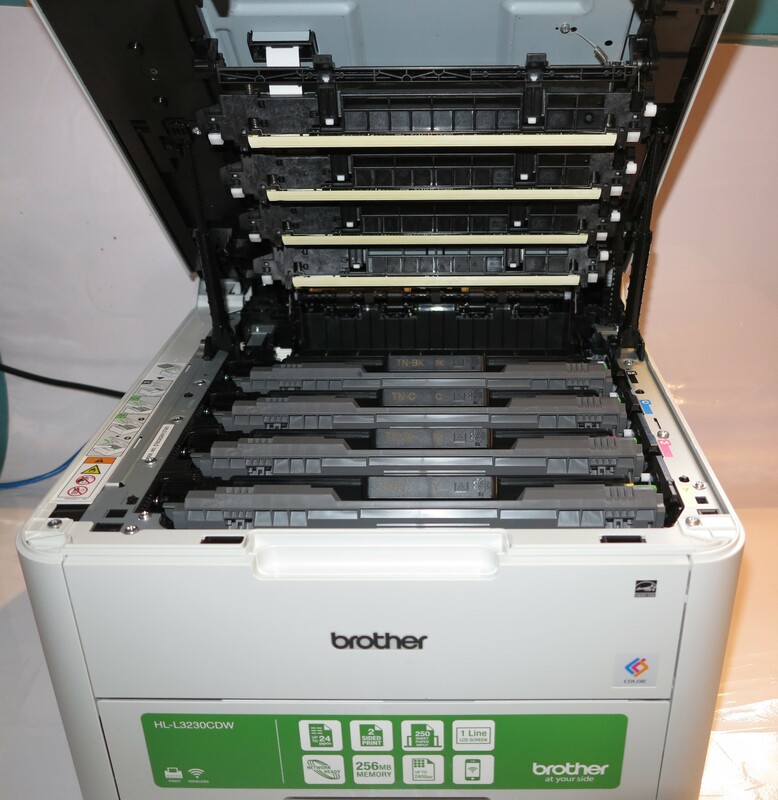 As for printing from mobile devices, the Brother HL-L3230CDW can print using Brother’s own iPrint&Scan app. But it supports driver-free printing in the form of Apple’s AirPrint and the Mopria platform as well as supporting Google Cloud Print. There is support for code-based secure job release but it requires you to enter the pre-determined release code using a “pick-and-choose” method not dissimilar to text entry on a Smart TV or video peripheral using its remote control. If the Brother HL-L3230CDW colour LED printer hasn’t been used for a significant amount of time, it would take around 20 seconds to yield the first page of the document from when you send the print job from your computer. If it was recently used, the printer would take around 10 seconds to turn out the first page of the print job. This is something that would be expected for most economy laser printers. This printer would yield sharp crisp document output even for colour work thus making it suitable for basic office printing including printing of desktop publishing work. I printed two test photos using Windows 10 Photos app along using the best printing-quality setting available and they came out slightly pale compared with Brother’s recent premium colour laser printer – the HL-L8350CDW. Most of the colours still come out vibrant although it doesn’t handle the flesh tones really well. Even though I haven’t had the chance to personally test the Brother HL-3170CDW or its stablemates that are based on the second-generation LED xerographic print engine, I had noticed a significant improvement on photo output quality over the generations compared to when I tested the HL-3075CW which used Brother’s first-generation LED xerographic print engine. What is showing up with the Brother HL-L3230CDW is that it is capable of yielding photo output that is good for ordinary use but not fully presentation-grade. 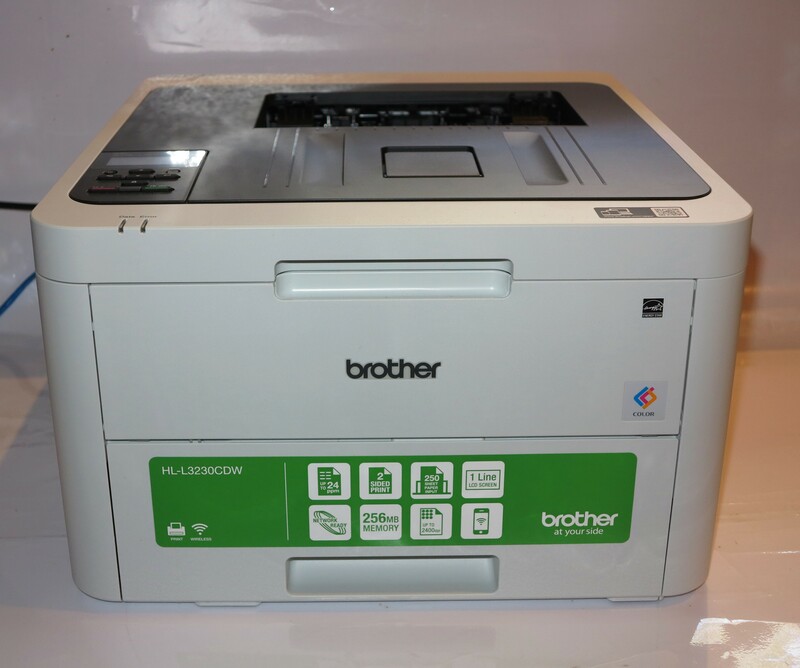 The Brother HL-L3230CDW’s LED print engine is the second colour LED print engine that Brother designed to implement an automatic duplexer across all of the models. But I have paid some attention to registration shift between the front and back of the same sheet of paper during a double-sided print run. Here, I had noticed a slight vertical shift where the back page was slightly shifted down from the front by a few millimetres. This is something that may be common with most desktop printers equipped with this feature but may be of concern with turning out print jobs like doorknob hangers, luggage tags or the like where you need to cut out a particular shape. Unlike the premium Brother colour laser printers, the Brother HL-L3230 doesn’t implement a “quick turnaround” approach to automatic duplexing. Rather it seems to work one sheet of paper at a time while doing a double-sided print run. One feature that Brother could work on with the economy colour LED printers is the registration shift for auto-duplexing. Here, they could make sure that there isn’t any drift between the front and back of the printed page, which can be of benefit for printing special-shaped work. It can also lead towards designing automatic duplexer mechanisms for printers that are paper-agile such as being able to work with smaller paper sizes or thicker paper. The manual bypass tray could be able to support multiple sheets of paper, which can be of benefit if you are turning out a significant quantity of labels, printed envelopes or other special documents. Another issue that will be of concern is the cost to replace the drum units when they come up for replacement. 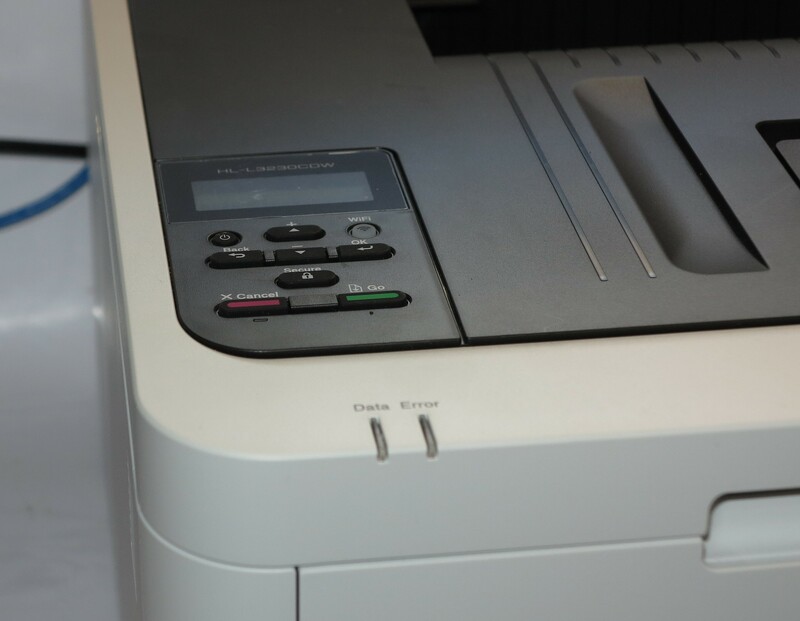 This can cause one to consider buying a new printer from the same range rather than replacing the necessary parts. It is more so where the drum units are being rated for fewer pages than the other components. Another improvement I would like to see regarding this printer is the option to start a firmware update for a network-connected printer from its control panel through the “Machine Info” menu. This could be augmented through a message on the printer’s display to say that new firmware is available like I have seen with some of the multifunction units they offer. Personally, I would see the Brother HL-L3230CDW as an entry-level casual-use option for a xerographic-based colour printer that is suited for small jobs. This could be something that is a home office or a private “document-preview” printer. 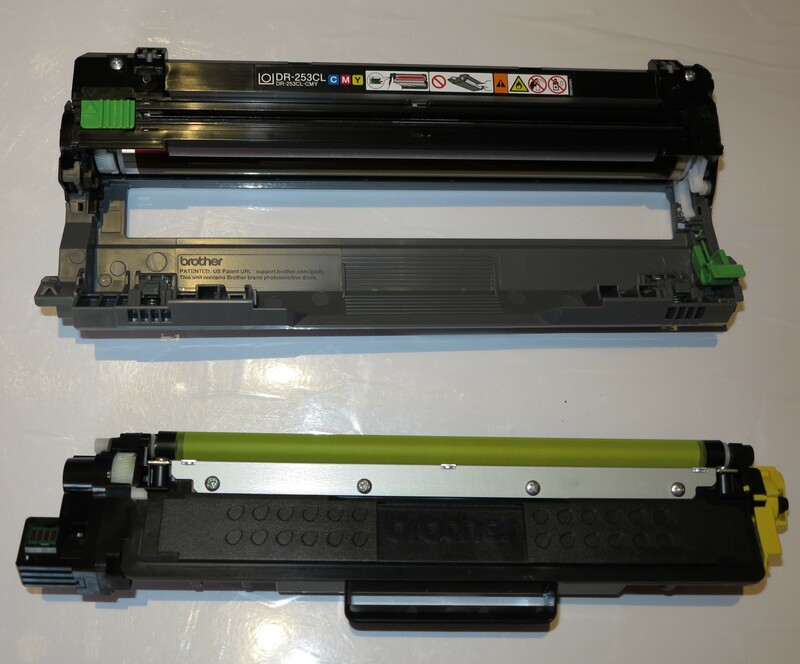 An issue that will be of concern is that if at least one drum unit or the belt unit comes up for replacement at the same time as a toner replacement, it could make us think that this printer is worth replacing rather than the necessary parts. This is a problem that I see being endemic with economy-positioned printers.